The guardian is guilty: April Parks, others plead guilty in guardianship abuse case. Long investigation of corruption in the state’s guardianship system uncovered horrific cases of financial abuse and isolation. That led to the arrest of private professional guardian April Parks and three others working for her. With Monday’s plea deal, it’s official — the guardian is guilty of exploiting the vulnerable people they were appointed by the court to protect. | F.A.C.E.U.S. Four people have pleaded guilty in Nevada’s largest elder exploitation case. Contact 13 has been investigating the case involving April Parks and others for years, bringing the situation to light. Four people collectively facing over 250 felony charges for crimes against the elderly are taking plea deals. Their convictions bring to an end what KTNV started nearly four years ago — the most significant guardianship exploitation case in Nevada history. Our years-long investigation of corruption in the state’s guardianship system uncovered horrific cases of financial abuse and isolation. That led to the arrest of private professional guardian April Parks and three others working for her. With Monday’s plea deal, it’s official — the guardian is guilty of exploiting the vulnerable people they were appointed by the court to protect. Judge Tierra Jones asked, “And ma’am are you making these pleas free and voluntarily? “Yes, your honor,” replied Parks. With that, Parks pleaded guilty to a total of six felony charges. 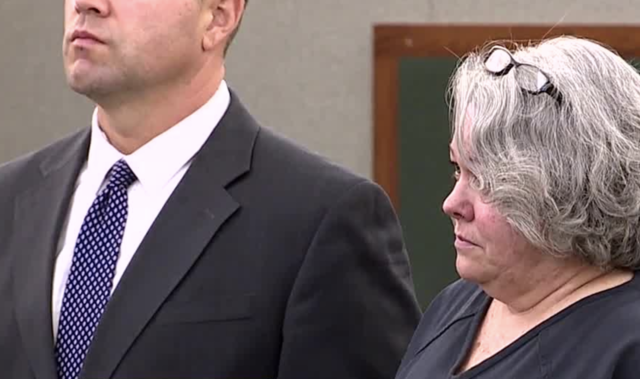 Plea agreements were also entered by her husband Gary Taylor, business partner Mark Simmons and Noel Palmer Simpson — one of several local attorneys Parks used in her guardianship cases in Clark County Family Court. Parks was the owner of A Private Professional Guardian, LLC. Last spring, Parks, her office manager Simmons, her husband Taylor and her Simpson were collectively indicted on 270 counts for elder exploitation, representing the most significant guardianship indictment in Nevada’s history. They collectively committed 117 counts of perjury, 73 counts of offering false instrument for filing or record, 42 counts of theft, 37 counts of exploitation and one count of racketeering. The fraudulent acts were committed between December 2011 and July 2016. Parks pleaded guilty to five felony offenses, including two counts of elder exploitation, two counts of theft and one count of perjury. Simmons pleaded guilty to one count of elder exploitation, one count of theft and one count of perjury. Taylor, who was named in seven counts of the original indictment, pleaded guilty to one count of elder exploitation. Several of these defendants also pleaded guilty Monday in a second related case where Parks, Simmons, Simpson and James Thomas Melton are alleged to have exploited an elderly couple through the use of guardianship between December 2010 and May 2017. In this case, Parks, Simmons and Simpson each pleaded guilty to another count of elder exploitation. Lawyers with the DA’s Office spelled out what they could prove if this case did go to trial — multiple billing scams, charging for unneeded services, and what became known as the Christmas Gift Scheme where Parks would buy small gifts like popcorn or socks for the elderly under her watch. Family members of Parks’ victims talked to us in court this morning. They’re asking for the maximum sentence when Parks and her co-conspirators come back to court. District Attorney Steve Wolfson says this will set the bar for addressing guardianship abuse nationwide. Contact 13 reached out to the lawyers of each defendant but they didn’t return our calls or declined to comment. Sentencing is scheduled for Jan. 4, 2019. We expect to hear from many more victims on that day. Under the terms of the plea agreements with Parks and Simmons, the state and the defense have retained the right to argue for what sentence they will receive. Parks faces a maximum prison sentence of 84 years in prison between the two cases. Simmons faces a maximum prison sentence of 54 years. Taylor’s plea agreement jointly recommends a sentence of 24-60 months in prison. Simpson will receive the recommendation of probation in exchange her cooperation. Parks, Simmons and Taylor have been detained in the Clark County Detention Center since their arrest in March 2017. This case was jointly investigated by the Office of the Nevada Attorney General and the Las Vegas Metropolitan Police Department. Prosecutors from the Office of the Nevada Attorney General and Clark County District Attorney’s Office prosecuted this case.